Prosecutors have ordered the detention of Essam El-Erian for 30 days pending investigations into charges of instigating street clashes. The vice president of the Muslim Brotherhood's Freedom and Justice Party will be held for 15 days over clashes between local residents and supporters of Mohamed Morsi in Giza's Bayn Al-Sarayat district in July, and for 15 days over clashes near Giza's Al-Istiqama Mosque in August. Security forces arrested El-Erian at a flat in Cairo’s Fifth Settlement suburb in the early hours of Wednesday after receiving a tip off. Pictures of the arrest, published on the interior ministry’s social networking pages, show El-Erian smiling to the cameras. During his time in hiding, he pre-recorded a number of video messages that were broadcast on Al Jazeera. In September, he was charged in absentia for his alleged involvement in clashes in Giza's Al-Bahr Al-Azam district in July. 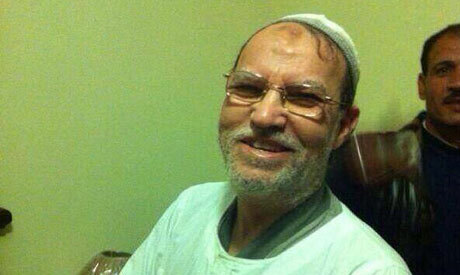 He also faces separate charges of inciting the murder of protesters on several other occasions, including at the Ittihadiya presidential palace in December 2012 and at the Brotherhood headquarters in June 2013. A number of other Brotherhood leaders are being investigated on the same charges. El-Erian was one of the few high-ranking Brotherhood members to remain at large after most, including Mohamed Morsi, had been arrested. The Brotherhood, which was registered as an NGO, was banned on 23 September. A case to dissolve the FJP is currently being reviewed after the State Commissioners Authority, a body that provides non-binding legal advice, recommended its disbandment. This terrorist should be kept in solitary, and never see the light of day Outside his prison walls. Allen, you are the true terrorist. You support the mass murderers and the child killers and the traitors. Mursi didn't kill anyone. He won the election, you lost. One more terrorist in jail, as it should be because that is where they belong. I commend & applaud the police & interim government for the job they are doing to stop the terrorism in Egypt!! As soon as Mr. Mubarak handed power to the generals in 2011, Colonel Fathi, the investigator, filed detailed charges with prosecutors accusing General Tohamy of colluding in the corruption he was supposed to root out, the colonel later said. But the case was quickly transferred to a military court and disappeared, he added. When Mr. Morsi was sworn in as president in June 2012, his power was initially circumscribed by a simultaneous military takeover of all legislative authority. When the generals finally yielded power in August, Colonel Fathi proclaimed in a television interview that the transfer had “dismantled the last shackle on freedom” as the revolution had promised. He refiled his charges and this time went public, declaring in the interview that General Tohamy “is one of the reasons for the corruption Egypt has suffered for the last 30 years.” “He is protecting the former regime,” Colonel Fathi said. In the television interview, Colonel Fathi said he had earned a master’s degree in forensic accounting and worked for 10 years in a secret unit handling delicate cases. He accused General Tohamy of consistently thwarting the agency’s investigators by locking away evidence in a “secret safe.” General Tohamy had covered up reports that Mr. Mubarak’s sons, Gamal and Alaa, were given use of a government-bought private plane, called Eagle 2, and a yacht, Colonel Fathi said. He also said that he had personally written reports on allegations against both Mr. Mubarak and Ahmed Shafik, the former president’s last prime minister and then a presidential candidate, but that General Tohamy squashed them. This whole thing will end with a deal of MB and the state, like they did many years back, when they were being hunted, you cannot win against the state. But we have to expect some more turmoil, for sure. Many years ago the state was backed by the US and Europe to hunt the MB. Today the MB are backed by the US, EU, AU, etc.. while the Egyptian State are hunting the MB down. There is no deal with the MB or any foreign country backing the MB however there is accountibility for what the US, EU, AU and MB are doing to dismantle Egypt just as what we are seeing with the rest of the middle east. If we writing against blood fake government then Al ahram is not publishing over comments. Is Al ahram pro bloody government? Of course it is..has always been. I am afraid of civil war because there is blood on both hands the current government and the Muslim brotherhood the arrests needs to stop and peace and stability needs to move on in Egypt enough!!! is enough!!! Ervin: the Islamists wonelection three times. You lost elections three times. You only have yourselves to blam.And fascism is unacceptable.It is either an open0ended revolution or real democracy. We are fed up with your corrupt analogies. You are wrong. The blood is on the hand of the fascist junta. The Islamists didn't kill a single person. Give me a proof to the contrary. Exactly, but tell me one thing: If the Rabaa sit-in had continued, then the state would have been dismantled. You tell me one thing: Which country in the world would have permitted a sit-in which was transformed in a snakes nest? They wanted to be a state within a state, which no government on the earth would permit. It's not that the Govermnent did not warn the protesters to leave: they did several times. It was the protesters who wanted to challenge the state, inflamed by some pocket money and food.